[July 28, 2010] People are beginning to complain about leaking sap coming from trees. Actually this has been going on for a week or so. What happens is a fine mist of sap coats things beneath a tree. This is actually called "honeydew," which is a secretion of sucking insects such as aphids and lace bugs. What makes matters worse is a fungus begins growing in the honeydew, making it turn black. There are two ways to deal with the problem. The first way is to spray the entire tree with a product such as malathion, bifenthrin or permethrin to kill the insects. The second way is to move anything portable from under the tree. If you opt for the first option, you need to make sure you can spray the entire tree. The kind of weather predicted will increase aphid numbers at a very great rate. The end effect on the tree isn't all that great as long as adequate moisture is available. This means a shot of water when it stays dry for a week or more. We'll also be coming up on lawn fertilization time in about a month, so that fertilizer will help the trees as well. As we enter August, we usually don't think of fall -- at least not quite yet. However, a quick trip through southern Illinois this weekend showed that the heat of the season has caused insects to develop faster than usual. The fall webworms are out in force, and they are one of the more visible fall defoliators. Let's begin by listing some of the culprits. Fall webworms, eastern tent caterpillars, tussock moth larvae, walnut caterpillars, cecropia moth larvae and a host of others are all considered fall defoliators. What is defoliation? It is simply removing the leaves from a plant. This group of insects accomplishes the feat by eating leaves. What does fall defoliation do to a tree or shrub? It does two things. First, it removes the leaf tissue so that less food is made for the plant. Second, the insects, their webs or their damage can be unsightly. In the end, damage happening to a tree or shrub in mid-August is usually cosmetic -- unless you have new transplants or plants that aren't healthy to begin with. Most fall defoliators come to us as the larval stage (read caterpillar) of a moth. When we talk about controls of the larvae, the fact that they are larvae of moths or butterflies makes them susceptible to the use of Bt products such as Thuricide. Other control options include the standbys such as Sevin, Othene, malathion, bifenthrin, permethrin and others. The way the insects live also dictates some of the control dos and don'ts. 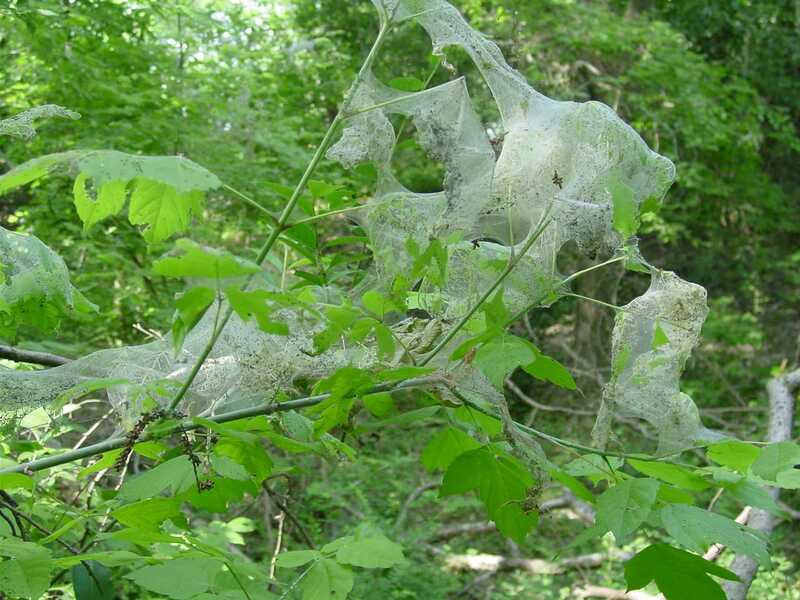 Fall webworms live inside a "web" all the time. They actually expand the webbing as they need to have more leaves to eat. They are usually worst on fruit and nut trees. You can even clip the nest (and the branch it is around) off the tree and burn it. I guess this tells you that defoliation caused by the insect isn't that great a threat to the tree or you wouldn't cut the branch area off. 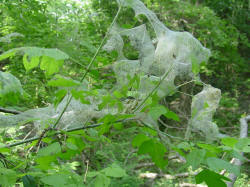 If you want to spray fall webworms, you need to get the spray through the web. This may be a little harder than you think. If you don't have enough pressure, the spray just runs off the webbing. In the case of eastern tent caterpillars, they hatch out of a common nest. They then leave the nest to feed, but they generally return in the evening to congregate in the area of the nest. They are not covered by webbing, and the time they are congregated is a great time to spray since they are usually in one area on the trunk or main branches of trees. In summary, control of fall defoliators isn't usually justified from the plant's standpoint. Forested areas have heavy pressure from this group of insects every year and the trees are still thriving. The exception is newly transplanted or struggling plants. If appearances are important, consider a control spray. 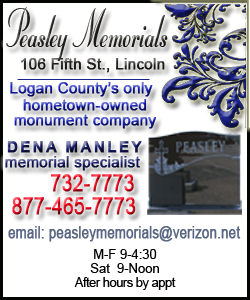 Logan County Fair week is coming up. We'll be hard to reach because of the various 4-H shows. 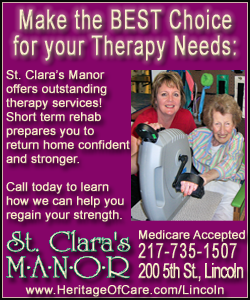 If you really need to speak with someone in the office, you can always call the office at 732-8289. You may have to leave a message on the answering machine, but we'll get back to you as we are able.